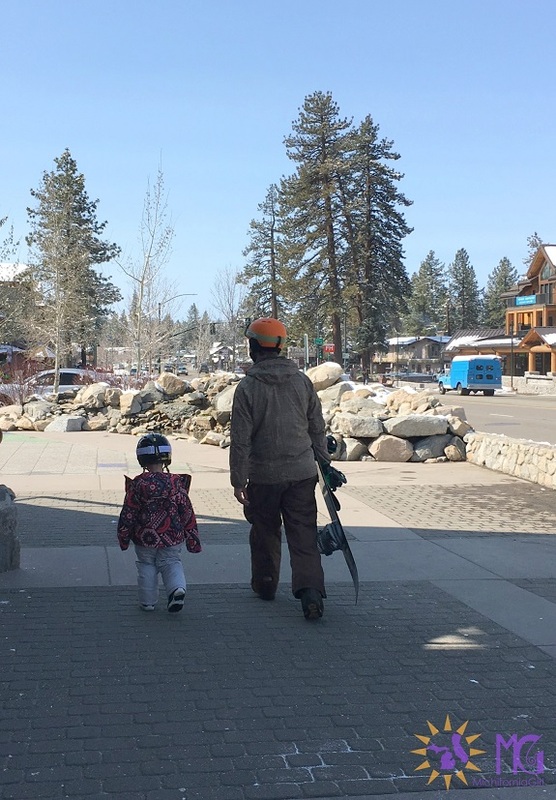 So here we are, in Tahoe, and I am sitting in the hotel lobby in front of a cozy fire while the kids color nearby, and we had to buy snow pants in April, and we’ve had a full weekend of swimming in the indoor pool and exploring different eateries and riding the gondola up to Heavenly. And here’s what I’ve learned: my kids are WAY better at snowboarding than I am. I made these people. I MADE THEM. And they are better than me. No really, I’m in awe of them, for this and a million other reasons. The drive to Tahoe took about five-ish hours, including a mid-way stop to rent P’s gear. Her snowboard was the smallest one they make. Apparently most kids her age (and younger) start with skis. Somehow, we were blessed by the nap gods and both kids slept — at the same time! — on the way up. The views were absolutely gorgeous, but the last hour was so dizzyingly winding that I MAY need a Dramamine on the way home tomorrow. Cross your fingers. 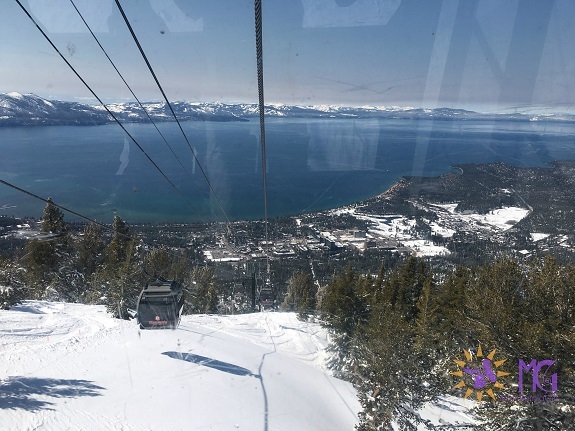 Um, speaking of motion sickness, let’s talk about the gondola that goes to the top of Heavenly. I don’t have an issue with heights whatsoever, and on this particular ride I was still a liiiiittle alarmed. People with a legitimate fear of heights (i.e. my awesome brother-in-law, who snowboards regularly): how do you do this? What are your coping mechanisms? Because wow. Or the time we took her ice skating with everyone from Al’s team, and it was literally the first time she had EVER strapped on any sort of skate in her life, and when she stepped onto the ice and could not IMMEDIATELY perform a triple axel, she was all set with that activity. It took more than an hour to coax her back onto the ice. As for B, he was VERY MUCH AGAINST the snow at first — I guess he is a true California boy, which breaks my heart a little bit. But once he saw his big sister coming down the mountain, he was all in. Since he wants to do every. single. thing she does, he insisted on stuffing his tiny little boots into her snowboard bindings while P took a break with some hot chocolate. The baby is a tiny bit perturbed in this particular video — he keeps saying his name over and over, which is his new thing when he wants to do something ALL BY HIMSELF, and he’s not super happy that Al keeps giving him a push start. He actually caused a little bit of a scene. People gathered behind us and stopped to stare. “I didn’t know they even made boards that small!” everyone kept saying, and “How OLD is he?” (A year and a half.) They called their friends over to watch. The baby gleefully cried, “Mo’! Mo’!” and he rode for almost an hour until I was sweating and exhausted from carrying him back up the hill. In sum: P keeps saying she wants to move to Tahoe. I keep saying that if we HAVE to move anywhere with snow, we’ll be heading back to Michigan, thanks. B is pretty much ready for the X Games. And Al is totally in his element. It’s been kind of a treat to bundle up again, but, um — and it hurts the Michigan Me to admit this — a few days of winter gear and I’m about ready to head back to seventy degrees. See you tomorrow, springtime! Oh, he was born ready. “a few days of winter gear and I’m about ready to head back to seventy degrees. See you tomorrow, springtime!” You are on the road, transplant! Took me many years but now a few days at our place in Big Bear suffices to satisfy the craving born of 24 years in wintery Illinois.